You’ll need to fly into the middle of the Atlantic to the Azorean island of San Miguel to find Furnas but to play this course only once is worth the trip in its own right. The Azores has a delightful temperate climate but it can have all four seasons in one day, so take your waterproofs. Furnas is set in a most gorgeous spot close to the lake and its thermal springs. It started out in life as a nine-hole course, designed by Philip Mackenzie Ross, a former partner of Tom Simpson. Don’t be fooled into thinking that these nines were a laid out in a rudimentary fashion. They were not. These nine Mackenzie Ross holes rank amongst the earliest holes created in Portugal but they also represent the best nine-hole collection in all Iberia. Bob Cameron and Chris Powell had the responsibility of extending Furnas to 18 holes and in 1990 the new Furnas was ready for play. This is what Cameron and Powell had to say: “When we were planning and designing the new 9 holes we were extremely careful to try to avoid the mistake – made on so many extended courses – of imposing alien design characteristics onto a naturally beautiful and classical golf course.” Cameron and Powell were on a hiding to nothing to blend the old with the new; after all, the old nine was flanked with mature trees including stately Japanese cedars. But the design duo did a truly remarkable job and, when kindly Nature has taken its course and the new tree planting has matured, the two nines will zip together yet further. 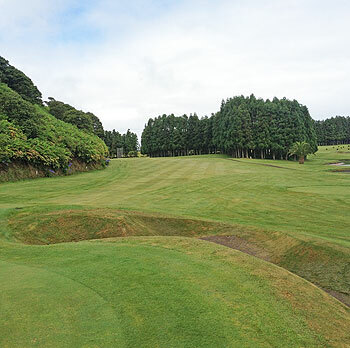 With smallish plateaux greens, which are wickedly contoured, you’ll need a sharp short game to score well at Furnas. Only those in the know appreciate how good this course actually is, so mum’s the word. On a wonderful Monday morning in mid September I drove to Furnas. The parking lot was empty and thus was a preview on the course and the clubhouse. Beside the local manager and two employees of the bar I was the only one around. I had a quick breakfast and then went to the pro-shop. I got the same deal as in Batalha a few days before (green fee, a set of clubs and either a buggy or a trolley for 93 €) and wanted to loosen up on the range before my round. To my surprise the manager escorted me out of the clubhouse and explained to me that the range would be right around the corner where the 15th hole of the course was located. To be clear: Not beside the 15th hole but on the hole. Unfamiliar to me, but who am I to judge? So, when I started my round, I already had an impression of what would lay ahead: Beautiful Japanese cedars framed the fairways, the vegetation was as abundant as it is on all Sao Miguel, fantastic weather. What else do you want when there is a full day of golf ahead? There are some fine golf holes on the course. Especially I enjoyed the sequence from the 4th (a long and tricky par 4, which is very well bunkered), the 5th (a par 5 with a blind dogleg right from the tee box) to the 6th (a very short par 4 with a volcanic hill to the right that you can hit over easily but blindly). A few nice but average holes would follow. They feel kind of artificial with water in the middle and lesser trees along the fairways. But the back 9 are fun as well with two very good holes at the end. The 17th is a par 4 with bumps and hollows as if it where a Scottish links and a fine green with water to it’s left side. The last hole is a par 5 with a fancy tee shot to a higher level. The route to the green is well bunkered and the target area is very undulated. What came after my round disappointed me a bit. I had only a light lunch, since there was nearly no choice. Okay, why should there be a full-service restaurant for only a handful of players, agreed. But then, when I wanted to start my second round at 3pm, the manager told me, that all the hired equipment had to be returned by 5pm since the clubhouse would close then. Again: There was so little traffic on the whole course that I understand why the staff is not eager to stay until the late evening. But I still ask myself why the manager could not find a better solution for the situation (“Just leave the clubs behind the clubhouse”). Well, he didn’t and I decided to go for another round anyway. 1:50 h later I was back and found the bar full of another group, enjoying their drinks and I could not get the impression that they were in a hurry. Anyway, I had a lot of fun on the course, but there is an uneasy feeling left. But all in all: When you are a golfer and you are on Sao Miguel you simply have to play Furnas because it is a (not exceptional, but) fine course. In opposite to the other reviewers I can’t confirm that is worth the trip alone, but there is so much to see on the Azores that it doesn’t need a golf course to go there. The Island of Sao Miguel is uncannily beautiful and this course is no exception. If there's such a thing as a 'hidden gem', this might be the perfect example. Mackenzie Ross had some incredible land to work with and the extension of the course has been done really well. Apart from the amazing Japanese cedars that surround most of the old holes (as well as some of the newer) you can hardly tell them apart if you don't know about it, as the style has been copied excellently. The green complexes are without doubt the coolest I have seen. Their cnontours are so wild with may false fornts, backs and sides that you really need to get to know the course. There are many bunkers and they are seriously DEEP. The sand is almost black which looks very special and makes you think about the volcanoes on the island. the greens are mostly raised by a few meters which makes the approaches even more interesting. my favorite hole was the par 4 12th, an incredible mid length par 4 that doglegs to the right. I drove a 2 Hybrid down the middle of the fairway and then there's between 170 to 90 meters left, depending on how agressive your line is since both sides of the approach are well guarded by cedars. The small green is a bit below you and guarded by devilish bunkers. I am only giving it 5 stars because I'm a links lover and I think the 6 ball rating is only for the absolute top courses. The course is definitely well deserved ranked within the top 100 in Europe and I can recommend flying into the Atlantic ocean very dearly as indeed the course is worth the travel on its own: But while you're on Sao miguel any way you might as well discover the rest of this paradisal island. I’ve played most of Portugal’s top ranked Algarve courses and those around Lisbon and they are excellent tracks but Furnas is simply sensational. Only the Old course at Vilamoura pushes Furnas in terms of sheer quality and design. In short it’s an absolute gem with rolling fairways and devilishly tricky greens that are inherently fair but they are quite small and tough to hit, especially those raised on slight plateaux. The par3 2nd is one of the best one shotters you will find anywhere in the world. It plays over water and is quite forgiving in that the lie of the land kicks the ball onto the green, but only the most accurate tee shot which finds the green has any chance of getting close to the stick. The medium length par4 4th is also a brilliant hole. I’d come back here to play Furnas again as it alone is worth the trip to the Azores.